September is National Yoga Month — an annual month long celebration designed to educate more people about the many benefits of yoga and inspire a healthy, balanced lifestyle. Coordinated by the Yoga Health Foundation, a nonprofit dedicated to spreading the awareness of yoga’s known benefits, teachers and studios are encouraged to hold free community yoga events and classes throughout the month. Over 1,500 local yoga studios are offering one week of free yoga to anyone knew to yoga, and there are 1,000 plus events planned nationwide. Designated a national observance and awareness campaign by the Department of Health and Human Services in 2008, this is the 8th year millions of yogis around the globe will celebrate their love for yoga and to celebrate we give you 8 classic yoga postures that feel pretty great to do. Sit on a folded blanket with your sitting bones propped up underneath you. Cross one shin bone in front of the other and slide your feet out until your heels are under the opposite knees. 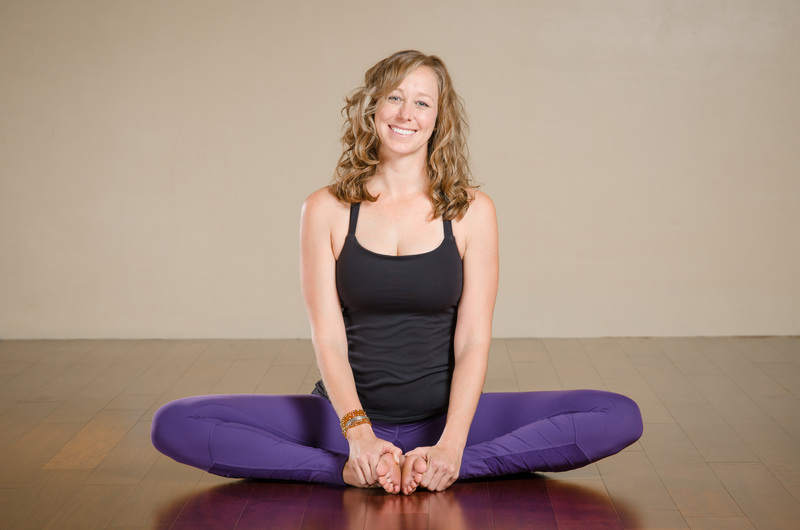 Allow your inner groins to drop down between your leg, lengthen your spine and lightly lift your sternum. Inhale and expand your torso with your breath; exhale and soften your skin. Start on all fours with your shoulders over your wrists and knees under hips. Initiate the cow movement on an in breath, dropping the belly, lifting the heart and tailbone, and looking up. Exhale, pull the low belly to spine, pressing the mat away with your hands and knees, rounding the spine for the ceiling and looking in toward your belly. Continue to inhale and exhale, moving through your spine. The iconic yoga posture. Just think of the hundreds of thousands of people in studios everywhere that will be doing Down Dog this month. From all fours with your hands slightly forward and as wide as your outer shoulders, make sure that your wrist creases are parallel to the front of your mat and the index fingers are pointing straight forward. Tuck your toes and press into the inner edges of your hands as you lift your hips up and back into Down Dog. Keeping your knees slightly bent, press your hip creases back and broaden your collarbones as you elongate from your tailbone through the crown of your head. Standing with your feet wide apart and parallel, hands on your hips, turn your right leg out 90 degree. Bend your right knee to a square, aligning your knee over your ankle bone, and keep your back leg strong and straight. Press down through both feet and lift through your sternum. Inhale and float your arms up to shoulder height; exhale and extend out through both arms. Take five breaths in Warrior II. From Warrior II, press into the inner edge of your front foot and pull the outer right hip back to straighten your right leg. Inhale, lift through the side bodies. Exhale, extend your right arm, rib cage and waist forward over your right leg. Bending to the right at the waist, place your right fingertips on the floor (or block) outside your right shin directly below your right shoulder. Press through both arms as you extend evenly through both sides of your body. Hold for five breaths, then hug your legs in toward each other, press down into both feet and rise to stand. Lying on your belly with your legs outstretched behind you, bend both knees, bringing your heels toward your sitting bones, reach your hands back and grab a hold of your feet or ankles. Spread all ten toes and hug your inner thighs toward one another. Inhale and, with a firm grasp on your feet or ankles, strongly kick your feet away from your buttocks, pulling your upper torso and head off the floor. Hold Bow Pose for five rounds of breath. Exhale and slowly release everything back to the floor and rest on your belly. Sitting on the floor, or with your pelvis raised on a blanket or cushion if your hips and groins are tight, bring the bottoms of your feet together allowing your knees to fall open to the sides. Holding on to the front of your ankles bones, continue to press the outer edges of the feet together as lengthen up your torso up, releasing your inner thighs and groins down towards the floor. Inhale and exhale, forward fold, walking the hands forward as necessary. Lying on your back, release both legs out long, allowing your feet and hips to roll out slightly. With your arms down alongside your body, palms up, lightly wrap your shoulder blades under and release the back of your body into the mat. Softly close your eyes, relax your jaw, release your breath and rest. Hope you had fun celebrating National Yoga Month with these 8 classic postures. Don’t forget to check out the Yoga Health Foundation’s website for more details on classes and events in your area.